Winter is cold in the Balkans. It’s the kind of cold that enters your bones and does not leave. And winter is not here yet, it will get worse. It’s a bright, almost sunny day in Gevgelija but the wind is strong and blows restlessly. As I speak with the other refugees from Syria, Iraq and Afghanistan, “cold” and “waiting” seem to be the most recurring words. We are in a large tent in the transit camp on the border between Greece and Macedonia. Refugees arrive here from Greece, they are registered by the police and then leave by bus or overcrowded trains. Inside the tent, there are a few electric stoves in the corners. But this is just a feeble attempt to bring heat and it would not be fair to say it is successful. This is where refugees wait while their registration is being processed. There is another similar tent near the rail tracks where they wait before taking the train. “Do you know how long this journey lasts? My family is scared,” said a refugee from Afghanistan pointing at his wife and two young girls. Unfortunately I don’t have the answer. It is difficult to predict how long this process can last and trains don’t have a fixed timetable. This adds yet another layer of uncertainty to the lives of refugees who undertake this difficult and dangerous journey from Turkey across the Balkans to flee war and find better lives in Germany or other destinations in Western Europe. This exodus started in July and reached peaks of 9,000 arrivals a day in October. The flow has now reduced to 2,500-3,000 arrivals a day. This is largely due to the decision of Balkan countries to close borders to so called “economic migrants” on 19 November, justified because of restrictions imposed by the next country on the chain. This arbitrary category encompasses all those who don’t come from Syria, Iraq or Afghanistan. 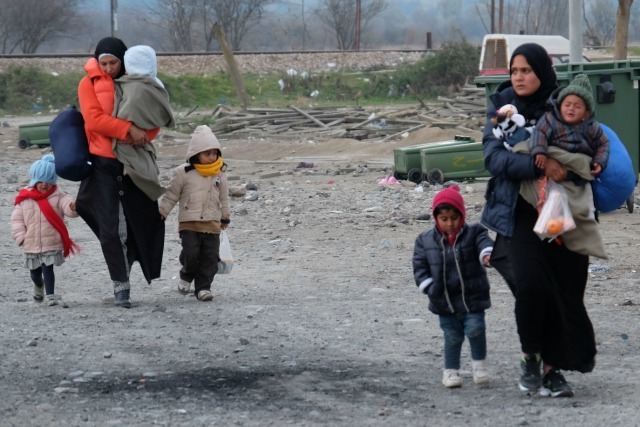 “Until yesterday we could hear shouts from the border with Greece,” said Fr. Dimitri, refugee coordinator in Gevgelija. “There was turmoil at the border for several days. The government sent 11 buses yesterday full of people to Greece. Now it is quiet, we can’t hear anything anymore”. This is only one of the many controversial decisions taken by countries along the migratory route since the beginning of the refugee crisis. It is fair to say that they are largely due to the inconsistency and lack of harmony of European policies. “We try to bring some comfort to those who still reach Macedonia,” said Fr. Dimitri. 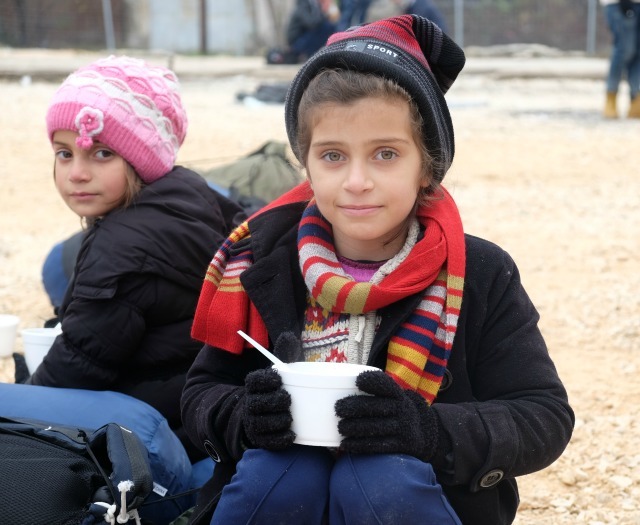 Caritas serves more than 500 portions of soup a day in the transit camp, alongside with hot tea. It is incredible how something so simple as a bowl of soup or a cup of tea can be infused with so much meaning. This is one of the few sources of warmth that crosses the refugees’ way. It’s also a small yet meaningful restitution of dignity and humanity, especially when soup and tea are served with a smile or with a word of comfort. “There is a high demand for this service, we will scale up if needed,” said Fr. Dimitri. It is dark now. The next train is about to depart. I hope that Adnan is on it and I wish him and all the others good luck even if they cannot hear me.